'Words We Don't Say' Still Hit Hard K.J. Reilly creates an indelible character in 17-year-old Joel Higgins, with his phone full of unsent text messages to his crush, his principal and his dead friend, and his profane, vulnerable voice. Just about any publishing professional will tell you that "voice" is one of the most important — and usually one of the most difficult — elements to capture in writing. When the voice of a book's main character comes through vividly enough, the reader doesn't just feel sympathy for the character, they become that character. Reading a book with great voice is like slipping on a second skin, seeing through someone else's eyes and walking a mile in their shoes, no matter how uncomfortable. Joel Higgins is a 17-year-old boy, a junior in high school. I am not, nor was I ever, a 17-year-old boy. I do, however, remember being a junior in high school and reading about another 17-year-old boy named Holden Caufield. I wasn't a huge fan of Catcher in the Rye back then — I wasn't cool enough to even pretend such disaffected rebelliousness. But to this day I remember Holden's voice, down to the way he described a lady on the bus, dripping with jewelry, as being "lousy with rocks." Joel Higgins's voice is just as strong as Holden's, but far more contemporary and far less problematic. He spends his Wednesdays down at a soup kitchen, fulfilling his requisite semester of community service with Eli, the girl he's loved forever. He refers to his mother as "Jesus, Mary," because that's how his father always starts his sentences when addressing her. He's not particularly book smart, dreading both English class and the SATs, but he can take a car's engine apart and put it back together. He constantly composes texts (and never sends them) to his school principle, to Eli, and to his dead friend Andy. K.J. Reilly introduces Joel in a way that makes him appear terribly complicated and incredibly simple at the same time, with a stream-of consciousness delivery that seems almost effortless. Through his eyes we fall in love with Eli — named after the Bible, not the football player — her enormous bleeding heart and her lists for everything. We adopt Benj Kutchner, the weird, newly orphaned kid surrounded by rumors about what really killed his parents. And we wonder how Andy died — but we have faith we'll find out eventually, the same way we know that the gun presented in the first act will be fired before the end. Reilly covers a myriad of tough topics: grief, friendship, family and sibling relationships, banned books, homeless veterans, gun safety, depression, PTSD, God, and Burning Man. Reilly covers a myriad of tough topics: grief, friendship, family and sibling relationships, banned books, homeless veterans, gun safety, depression, PTSD, God, and Burning Man. Okay, so maybe Burning Man doesn't qualify as "tough", but it's definitely a topic of conversation. On top of all that — as the title hints — the things that go unsaid in this book are often just as important as the things that are. 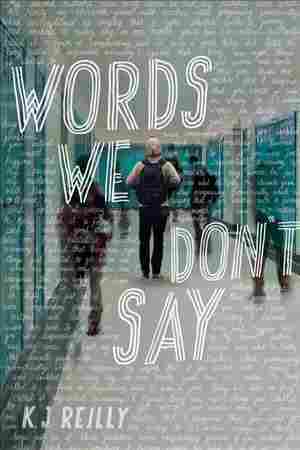 Words We Don't Say was an easy read that packed some hefty punches. It made me cry on two different occasions, definitely a mark of excellence. I truly cared about the characters in this book, not just Joel — but Eli and Jace and Benj and Rooster as well. I wanted them all to thrive, far beyond the book's ending. I wished them a modicum of happiness and peace in their complicated, fictional lives. And then I blew my nose, wiped my face, and went to go find some peace in my own.